Earn $4.79 in Podium Club credit (479 points)What's This? 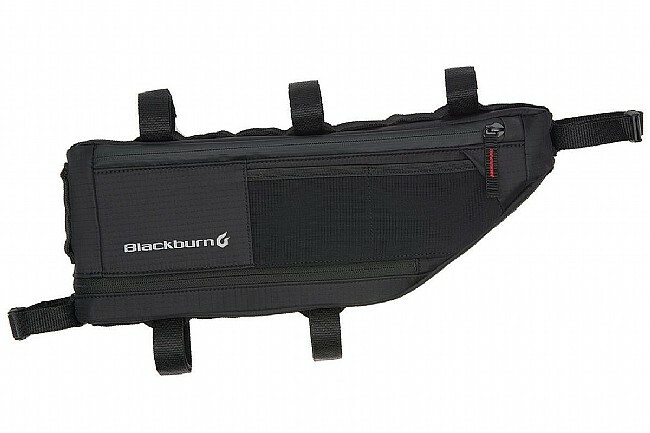 Blackburn's Outpost Frame Bag makes use of the empty space in touring or bike-packing frames and keeps cargo weight centralized for predictable handling. External mesh and slip pockets put essentials close at hand, and the zippered main compartment includes a baffle to help keep things organized. For picking up extra items along the way or for when repacking gets a little untidy near the end of a trip, the bottom is expandable to create some extra room, which is always welcome. Features a hydration hose port for use with water reservoirs. Water-resistant. Available in two sizes.